Starting equipment was sparse and starting GP was not even close to enough to outfit everyone so just like in the source material they were forced to go out into the wilderness under-equipped. I wanted to create a strong feel of old school gaming in this so the townspeople acted much like 16-bit NPCs and talking to everyone was vitally important to learn about the surrounding wilderness as well as to gain some quests and eventually learn where the nearest dungeon was. 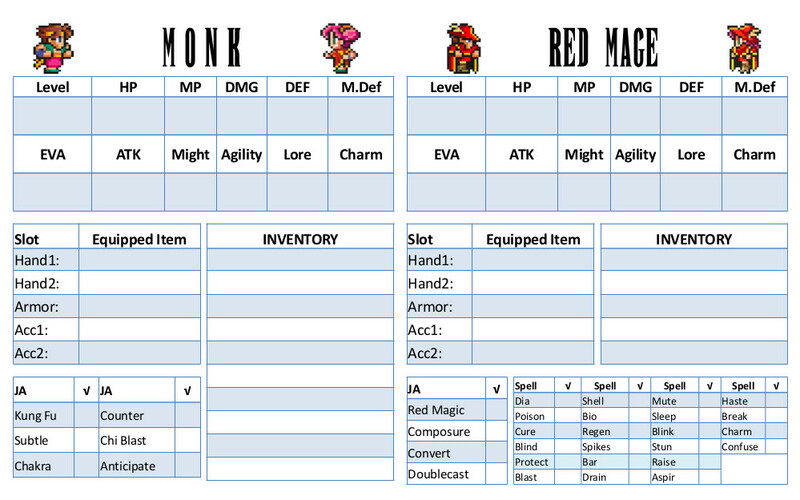 I've added a pic of the character sheets for Red Mage and Monk so you can get an idea of what is tracked in play. The main thing to notice is that mages have fewer lines in their inventory, 5 instead of 10. This matters since each line can only hold 1 item, though some items can stack. A Wolf Pelt takes up an entire line on its own, but Potions can stack to 10. A single Potion still fills the line though. So let's have a look at what I've learned from this experience. The system itself ran smoothly with the offense vs defense of the classes and monsters working as expected. Combats were very, very fast. The longest one took about 5 minutes which was good since we played through about 3 dozen total. XP from monsters defeated and quests completed worked out well. The PCs earned a total of 161XP, 45 from quest completion and the rest from straight out grinding. The quest rewards could stand to be about 10-25% higher in my estimation. PCs need 100XP for level 2 and 400 more for level 3 (500 total). Monsters are worth Level^2 as a base, Goblins are 1XP, Skeletons are also level 1 but they are worth 2. Wolves are 4xp while Ghouls and Slimes are 6. The rate of GP gain was much too low at first though so we had to wing an increase in play that seems about right. Monsters each have a basic amount of GP they drop and the PCs get to roll for loot after the fight using the highest Agility Die of the party for each type of monster with a bonus for the number of each type. In this case it was the Thief's D12. On 4, 10 and 16 the loot of the monsters improves based on monster type and level. A party with a level 2 Thief also enjoys the Finder 1 ability which automatically improves all loot rolls to the next tier which is in many cases the only way to get the 16+ loot drop. I made up all the loot as we went and will be using that to make some solid tables now that I know what feels right in play. Monster AI took too much time to emulate. Instead of choosing how the monsters would act and which of their abilities they would use I randomized it all and it simply took too long. For instance a Goblin attackign the party had to roll to determine target (which was 2 rolls in the inefficient way I was doing it) and then roll again to pick its attack (Standard or Goblin Punch) and then it rolled the actual attack vs the target's Evasion. A faster way to do this is needed, assigning numbers to the party based on marching order and combat row before hand seems the best way. Sudden Death has hit a plateau, I think its time we go for it though so look for a How to Play video in our next blog post. Time constraints due to the sudden inspiration for 16-Bit Adventures coming together have slowed down adapting the art for our PNP but its still coming along otherwise. One advantage of this idea is that we will be able to do Assault on Laser Shark Lagoon in this format pretty easily and if that works the other planned expansions will follow quickly.